These are, among common tech users, the most common symptoms of a dying hard disk drive. Usually these kind of things happen when you’re hdd gets a hit (when it crashes on the floor for example). Other times is the old age of the device causing malfunctions and sometimes the issue apparently seems to burst forth without any reason. But let us first take a look of an hard disk device internally. 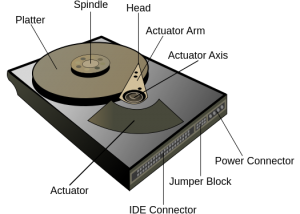 Data are stored on a platter and read/write functions are made by a magnetic head placed at the end of an actuator arm which moves depending on when data are placed. Actuator is controlled by a PCB controller hosting connectors and usually located down to the device. When an hard disk is damaged there are 2 kinds of failure: physical and logical one. In logical failure just data are damaged and not the device itself, while in the physical failure case one of more of the components of the hard disk drive are malfunctioning (most common are damages of PCB or issues with the actuator and the magnetic head. Many people realized their hard disk is damaged first before seeing it is not responding on the computer. This happens because of the typical noise of dying hard disk, usually known as the “click of death”. But, what is the click of death? Well, just the arm moving back and forth among the platter until it reachs its physical end (the spindle) [from point 1 to 2 in the image]. On the other hand any hard disk drive makes a small sound, but in most cases you can’t hear it. Then the arm normally moves on the platter from its start to the point where data are placed and on that point read/write functions are performed. When the device is damaged the arm moves continuously because it can not find data on the prescribed point, so it comes back and and the operation is repeated. People reports various kind of noises in the damaged hard disks: these different noises are caused by different types of malfunctioning. For example if the arm is damaged, it makes a shrill noise because of the contact with the platter. 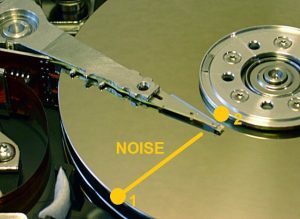 Other kind of noises are procuced when spindle (image 1) is damaged and platter can not spin at its prescribed speed or PCB is not working properly. When an hard disk starts giving issues, first step to do is to understand if it is recognized by the computer. If it is, then you have to save all your data immediately to another device because you will most likely see it disappear at 2th or 3rd run after the first malfunction. Obviously it does not always disappear, but this is the damaged hdd behaviour so in the vast majority of cases. You can easily save your data creating with a lot of disk imaging and cloning software (ddrescue, run with linux, it’s the most used) or even with recovery software some of which can create, and save, a disk image of your damaged device. Recovering data from a not recognized hard disk is a slighty harder target: it has to be considered that this does not means that data are irrecoverable nor that the device is dead: indeed it can still be recognized by the BIOS of your computer: if it so, best way to recover data is to run Ddrescue or use an hard disk imager (Deepspar PC-3000 or Atola Imager). These devices can access to the data at the lowest level when they are not responding to the computer reading system. If none of these options is workable, the only way to approach to the damaged hard disk with an almost good chance to recover data is to send your device to a data recovery center, which will use more detailed ways to recovery, such as direct reading hard disk platter. Usually these company ask a fee between 500 and 2000 or more dollars for a standard (500 GB-2 TB) recovery, so even if it remains the option used by some people like business men, many people prefer to lose their data instead of paying their quote. and on the other hand there is no accurate literature on these cases in order to express themselves. Then, a self-repair attemp seems the only way to approach to the damaged hard disk: you can perform 2 kind of self-repair approaches: first one is the PCB replacement, second one is to physical displace the entire hard disk except the platter. In order to make a PCB Replacement you will need a PCB controller, exactly the same as your hard disk model. Buying a single PCB can be sometimes very expensive so it is usually to directly buy another hard disk equal to the one you own (hard disk number and firmware version must coincide). Once you get the hard disk you need to remove the PCB to replace it in to the damaged hard disk instead of the previous one. Removal is very simple: unscrew the hex screws that connect the PCB to the new hard disk, do the same for the damaged one, and place the new board on the old one. Then you can try to run the device and see if it works. If not, the new hard disk you have bought will be useful again: you will need to swap the hard disk platter. This task consists to remove, very carefully, the platter from the damaged hard disk, and then put in on the new hard drive instead of the new platter. An advice: performing the platter swap pay attention to the arm and the magnetic head: any alteration of the same will not only cause the device to continue malfunctioning, but also it will make it unrecoverable because of further damages.